The internet is a dangerous thing. 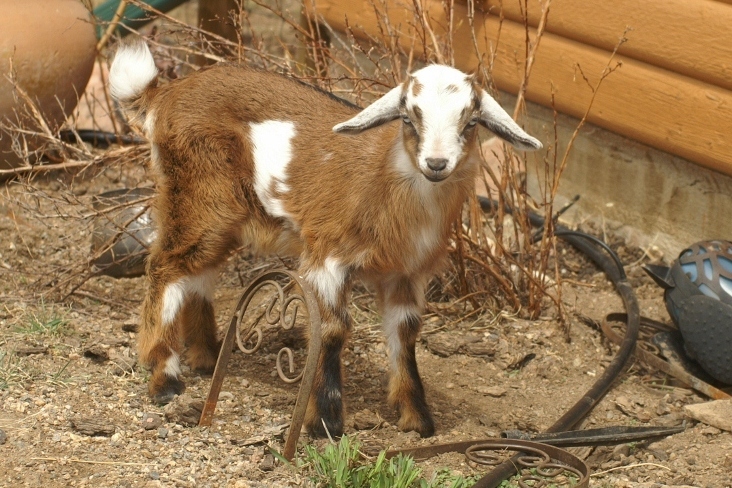 A few years ago while browsing the web I stumbled upon Mini-Nubians-and instantly fell in love. Until then I had avoided goats,granted I thought they were cute and all but I just didn't want the hassles of owning goats, dealing with trying to contain them, chasing down escapees as they mowed down my garden etc. No thanks, no goats for me. But that all changed when I saw those adorable mini-nubian faces staring at me. I read up on them, and found my fences would work for them, they could be housed with my sheep, they are good milkers, what was not to like? And did I mention they are adorable? Above is "Patrona" our first mini-nubian pictured at just a few weeks old. She is an "F1 mini-nubian", meaning she is 1st generation cross. Her sire was a Nigerian buck, and dam a mini-nubian. Now to be perfectly honest, I can't pretend I haven't chased down escapees or had my garden mowed down but that is more a result of crawling of squeezing through gaps between fences and gates and crawling under fence. But it's been worth it, I've learned how to keep the goats secure (well for the most part), and can vouch that with decent 4 foot mesh fencing, these goats can be contained. Patrona at one month old-irresistable! Since acquiring Patrona I have acquired a couple more does and bucks and have a sweet mini-herd. The mini-nubians are used in our herding program and they are also milked, with their milk being used to make soap and cheese. We raise just a few kids each year. These goats haven't disappointed me, they are easy to handle, very personable and easy to manage. They have kidded unassisted and have been good mothers. Meet our Does here and the Bucks on this page!